According to SECTUR- In November 4 this year, Merida is in the eyes of the world to host the World Congress LIX Women Entrepreneurs, an international event that will bring together more than two thousand entrepreneurs from 70 countries who addressed as a central theme communication from the perspective of business and economic areas of social, political, and all those involved in the development of women who preside over companies. The World Congress of Women Entrepreneurs will have the fundamental objective of encouraging and counseling to all women entrepreneurs, as well as within it that will protest, Laura Frati Gucci world as the new president to be proceeding in parallel with the VI Latin American Meeting of Women Entrepreneurs. Also, those dates will be held in this capital city of Yucatan "Summit of the Countries of America." The development of these international events will be held at the Convention Center "Siglo XXI" and is made possible by the support given to the organizers-Les Femmes Chef's D'Entreprises Mondiale (FCEM) - The governor of Yucatán, Ivonne Ortega Pacheco and Angelica Araujo Lara, Mayor of Merida. It must be remembered that this was recently released by Alia Lorena Ibarra Avalos, Mary Carmen Rosa Elena Garcia and Lozano Noemi Vasquez, national president of the Mexican Association of Women Entrepreneurs (AMMJE), coordinator of the Congress and vice president of FCEM, respectively . It is expected the attendance of representatives of the Organization for Economic Cooperation and Development (OECD), Inter-American Development Bank (IDB), International Monetary Fund (IMF), World Bank, Bancomext, Nafin well as officials from the Ministry of Tourism (SECTUR), Ministry of Economy, and the country's president, Felipe Calderón Hinojosa. An event of this level can be allowed to promotion and the alternative that women entrepreneurs can do business, even having the ability to export, but also an excellent forum to attract investment.This because during the World Congress of Women Entrepreneurs is a business center installed a show-business within which will women entrepreneurs of the Yucatan Peninsula and across the country, as well as representatives of the participating countries, promote products and services abroad. 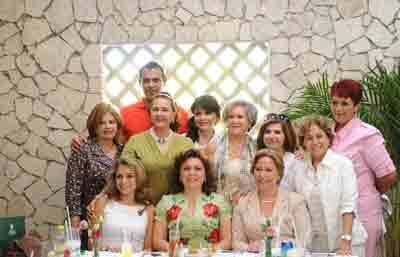 The meeting with the president and women entrepreneurs also attended by the mayors of Merida, Angelica Araujo Lara, and Progress, Mary Esther Alonzo Morales, the head of the Unit of Economic Development and Employment Promotion of the City of Merida, Diana Medina Castañeda and the lord, Katia Puerto Manzanilla. Also attended by the Secretary for Economic Development, Víctor Cervera Hernandez and communications director FCEM Congress LIX, Adriana Alvarez Martin.